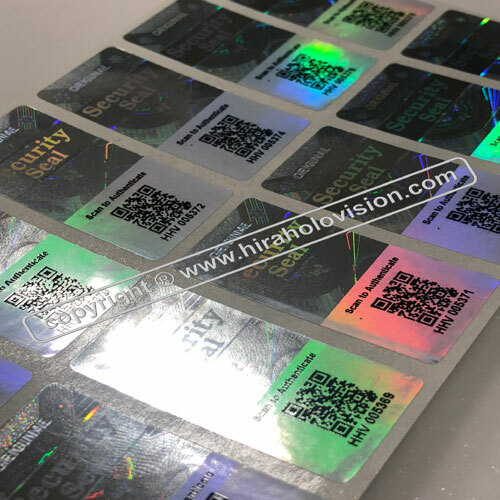 Hologram Labels Hira Holovision offers a variety of affordable Hologram Labels, which can be custom imprinted with your company name, logo, consecutive serial number and other features. We allow users to incorporate a variety of information and security features like tamper evident, laser numbering, inkjet numbering, hidden codes etc., in the Holographic Label. These labels are best solution to protect your company from any type of forgery as they cannot be copied. Holograms are used extensively for the protection of the products authenticity and brand image. In addition, holograms are also used to protect originals of important, sensitive and valuable documents against forgery.